Follow our complete, step-by-step, photo illustrated instructions to make one of the South’s favorite side dishes. I may have been “born and raised” in the South, but I’m not much of a vegetable fan for reasons unknown. But, these two would be my first choice from any table or buffet. If it were Potatoes and Green Beans, that would be even more like it. Smile. I do love my potatoes. You could open up a can of beans and a can of “taters”, but why not do them fresh when they are available. Fresh vegetables are so much better, and at this time of the year, they’re starting to show up at roadside stands, farmers market and more. Whether you call them green beans or snap beans doesn’t really matter. They’re one and the same. Mama cooked them a lot, and she put a lot of effort an love into storing them up for us to also enjoy during the winter months when fresh ones weren’t available. Usually she was out in the garden early in the morning to pick the beans, a bushel or more at the time. Next, she would grab a big old dishpan and head out to the front porch, usually with a neighbor or relative to string the beans and snap them. I can easily visualize her sitting in her wooden rocker, apron on, dishpan filled with beans sitting in her lap. Often, there would be a glass of sweet tea sitting on the wooden floor of the front porch right beside of her. As long as it took, they would sit and talk, string and snap, until the beans had all been cleaned and ready for cooking, canning, or freezing. The summer sun would make the day hot, but the shade and hopefully cool breeze on that front porch were a welcome time of the day to sit down for a little bit, but still working just the same. I couldn’t help but recall those days as I worked on the 2 pounds of fresh beans I had purchased to prepare this recipe. No matter how hard I try, they will never be as good as hers. Smile. Red potatoes were used here, mostly because I had them on hand. They also hold up a bit better during the longer cooking time it will take to get the fresh beans cooked to perfection. Russets are good, but break up too easily after being cooked for awhile. The day before I cooked these, I did another post here on Taste of Southern called “How To Render Bacon Fat.” I wanted some bacon grease to season my beans with. It’s liquid gold for such purposes. So, if you’re ready to cook up a pot of beans and taters like Mama would do them, then let’s get on in the kitchen, and… Let’s Get Cooking. 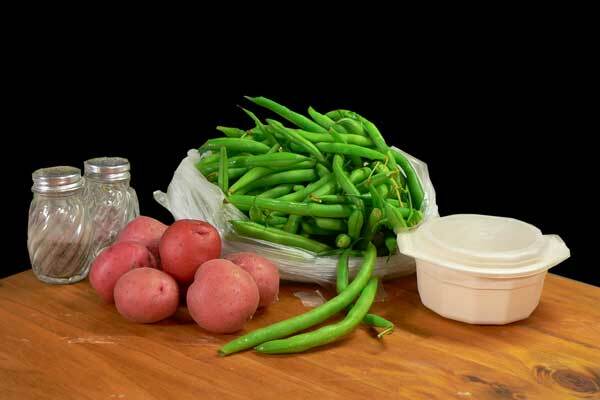 You’ll need these ingredients to make our Green Beans and Potatoes recipe. 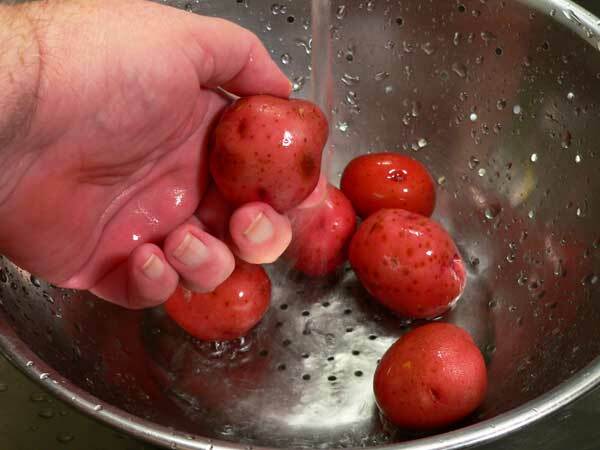 Begin by washing your potatoes under some cold running water. Gently scrub in the indentations to be sure you remove any dirt that might be in those. When finished, just set them aside for now. I like to place some cold water in the sink to wash my beans. 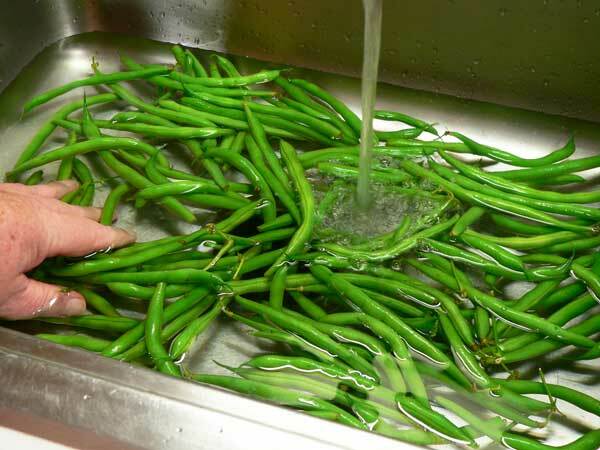 It’s kind of hard to just rinse them under running water, so place the beans in your sink and add enough water to get them to float. Then, swish them around good for a few minutes, looking for any trash or leaves as you rinse them clean. Use your hands to scoop the beans out and place them in a large bowl or colander before draining the water and dirt from the sink. Any dirt will settle in the bottom of the sink as you wash the beans. If you just drain the sink, the beans end up resting on top of the dirt and you haven’t accomplished very much. Lift them out first, then drain the sink. Thank you for listening. Smile. Now it’s time to start the fun part. Yes, we’ll do this one bean at a time, but it won’t take long. This is where Mama would place all the beans in a dishpan and head for the front porch to rock in her chair and snap the beans. These particular beans are fresh, young and tender. They don’t have a lot of “strings” on them, but you may have some that are a bit older that will need to have those strings removed. Stay with me for a minute because I don’t have a photo to illustrate this point. See me holding the bean in the photo above? I’m holding out the end that was attached to the bush the beans grew on. You’ll need to grasp this end between your fingers and snap the end. If it has a string attached, gently pull the end back and the string should come completely off as you pull the end down the length of the bean. When you get to the end, snap that end off, and you should be able to pull that end back around and peel the string off from the other side. It’s not complicated and you’ll get much faster at this process after you’ve done a few. If you leave the string attached and cook the beans you’ll end up trying to chew the tough string, thinking you’ve found a hair or something in your beans. You don’t wont that to happen now do you? Snap off both ends of the bean, removing any strings as you go. Next, just hold each bean in your hands and snap it into bite sized pieces. Continue to pull the strings off, snap the ends off, and snap the beans into bite sized pieces until you have them all done. Whew! I only had two pounds here and I’m not very fast at this myself. Of course, I wasn’t rushing. I was watching a program on the computer while I did mine. Mama, and my aunts, use to sit on the porch and do this a bushel or more at a time. I couldn’t help but think about that while I sat in air-conditioning and working on these few. Times sure have changed haven’t they? I decided to cut my potatoes into quarters. They were small to begin with, but I decided to cut them since I didn’t have but a few on hand at the time. You can leave yours whole if you prefer. They will have plenty of time to cook as we boil the beans. Grab a good sized stock pot and place the beans and potatoes inside. Add enough water to cover the beans by about 3 inches. You’ll need a good amount of water to begin with. It will evaporate down as the beans cook. Add your seasoning. I’m using about a Tablespoon of Bacon grease from where I just did the post on How To Render Bacon Fat. It’s a great seasoning for beans in my opinion. We can’t forget the sugar. Mama always added a small amount of sugar to just about all the vegetables that she cooked, so I’m continuing the tradition. It just knocks the “edge” off of the taste of the vegetables as they cook. Cook on Medium heat for 1 hour or longer. Place the pot on your stove top over Medium heat. Once they start to boil, turn them down just a bit and let them cook at a low boil until tender. You want the beans and potatoes to be done, but some folks like a little crunch in them. Just cook them until they reach the desired doneness that you and your family prefer. After an hour on the stove top, add in the Black Pepper. You may also notice that I added a couple of strips of leftover bacon to this pot. I just had it in the kitchen following another recipe I’d prepared so I tossed it in for a bit more flavor. Mama often used a big chunk of fat back, or a piece of side meat to season her vegetables. It pretty much depended on what was available at the time. You get similar results from them all. Smile. Give everything a good stir with a large spoon, and continue to cook the beans and potatoes until they are done. Mine cooked for an hour and a half to get to the point that I like them. Mama always “cooked them to death” as the old folk would say, but they sure were good. Serve them warm and enjoy one of the South’s most favored side dishes. Mama would have a bowl like this, sometimes with potatoes and sometimes without, sitting on that big oval dining room table every Sunday after church. Good times with all the family gathered around. 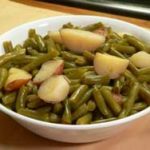 Easy to follow, step-by-step, photo illustrated instructions on how to make our Southern Green Beans and Potatoes. Printable recipe included. Wash the potatoes under cool running water. Set aside. Place a couple inches of cold water in your sink. 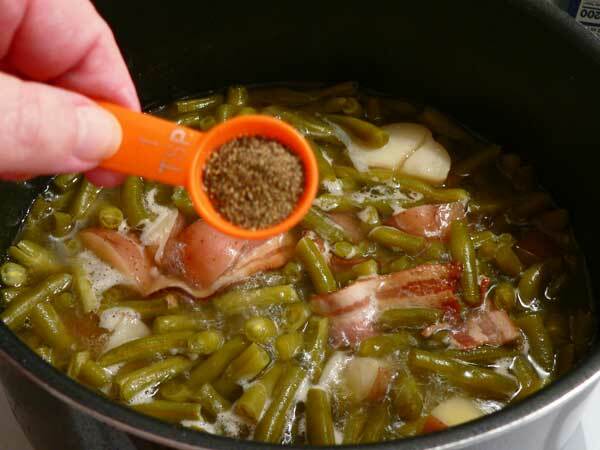 Add the green beans. Swish the beans around to wash them, removing any leaves or debris. Lift the beans out of the wash water. Place in a colander to drain. One at a time, snap the ends off the beans, removing any strings as you go. Snap each bean into bite sized pieces. Place the beans in a large stock pot and cover with water by about 3 inches. Add the red potatoes. Cut them into quarters if preferred. Place on stove top over Medium High heat and bring to a boil. Reduce the heat to Medium and let cook for one hour. Add the salt. Stir well. Continue to cook the beans and potatoes until done as desired. Ham hock, hog jowl, side meat or fat back can be used as a good Southern type seasoning instead of the bacon grease. 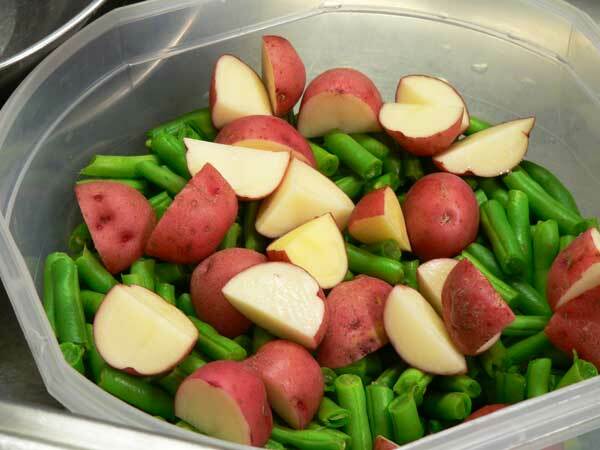 Ever made Green Beans and Potatoes with fresh vegetables? 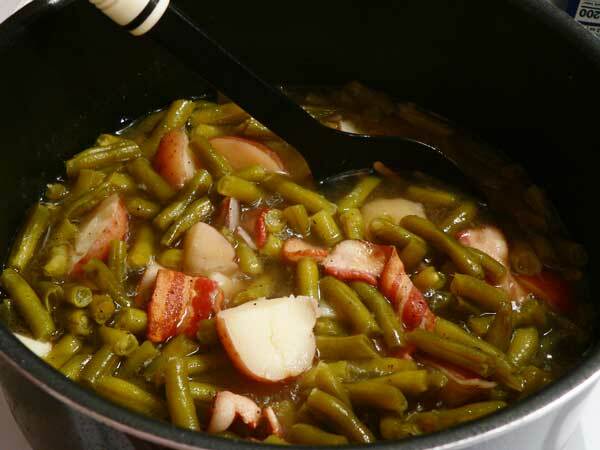 Share your memories of this great Southern side dish. Hi Steve, I left a comment for this recipe back in July. This recipe has been a staple in my house ever since you shared it. It’s winter now so I am tending to use frozen green beans. They turn out just as delicious. What do you think about this…do you think I could substitute fresh carrots for the green beans? Do you think they would absorb the bacon flavor as well as the green beans do? I’m wondering if you have ever tried different veggies with the bacon seasoning. Carrots are wonderful in my opinion. Take care. Thank you for your response. Oh my. I have many lovely recipes for carrots. For Thanksgiving, I tried a new one and it was wonderful. I am not a big fan of cooking with alcohol, but Bourbon Glazed Carrots was what I made and was a hit. (I really cannot even stand the smell of bourbon! Go figure.) Simmer and stir 1/4c brown sugar, 1/4c butter and 2tbsp bourbon for about 10 minutes then pour over approx. 2 pounds of boiled, coined carrots. Very nice. It was much better the next day, in my opinion. I’ll try your recipe with carrots and I’ll let you know. AWESOME Just the way my grandmother cooked them except for the sugar. Never sugar!!! Great recipe Steve!!! Delicious:-)), without the sugar. Oh Steve you hit my country roots. My momma and I used to make these all the time..love them! How about new potatoes and fresh peas creamed? I was born and raised on a farm in California and my Mom was originaly from Oklahoma, so we always had good ole’southern cookin’. I love your recipes and so look forward to so many more, God Bless you and keep up the excellent recipes…My prayers to you and your friends. I love everything about the recipe this week and I have eaten “snaps” (as we call them) with potatoes (and sometimes without them) my whole life. The picture could be on a menu or in a cookbook because I feel like I could taste them! All of your recipes and your newsletters make me feel “at home”. Thank you for all you do. My mother made this often and it was always a big hit. She always added a small “Cottage Ham” to the beans and potatoes. The pot liquor was great to. We dipped buttered rye bread in it. We call ‘cooked to death’ green beans Cookalldays – as though it’s one word…I make them the same way and freeze the pot liquor for another batch or to add to soup – sometimes called Refrigerator Soup made when I clear out misc remains – add some more vegetables, that last pieces of sausage or leftover beef, pork, chicken – whatever. Cookalldays have been and always will be a favorite. 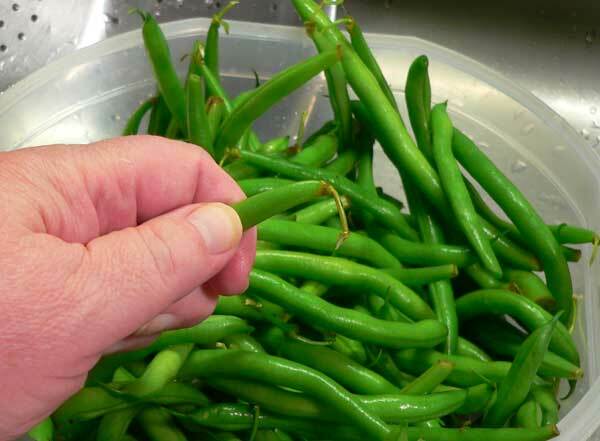 I live in Florida – my folks and their families were from Indiana – my grandmothers made green beans the same way. Cookalldays distinguishes them from store bought canned or frozen. Never really thought much about it so thanks – it made me smile to consider why we say that! Thanks so much for this. Its my favorite way to cook fresh green beans though I have to admit my children and I prefer home canned green beans to fresh. We used to cook them slowly on the back of the woodstove until most of the liquid was gone. Sometimes I’d add a hambone or hamhock. Sprinkling on a little dash of cider vinegar or homemade pepper sauce tastes good too. 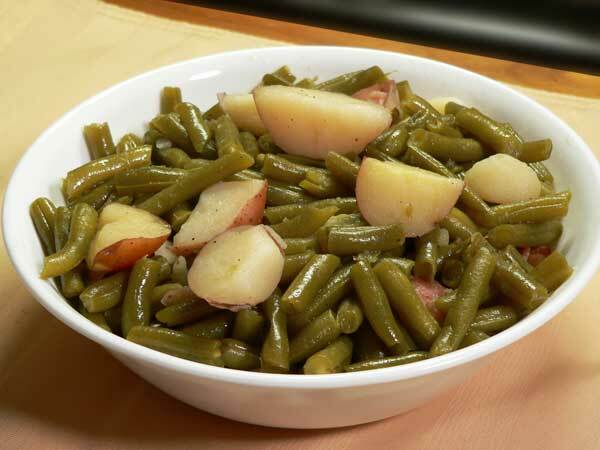 This green bean and potato dish looks so yummy! I can hardly wait to make it. I do have a couple questions, though. Maybe I’m supposed to know the answers instinctively, but I don’t. 1. Do you use the lid at all while you’re cooking the beans and potatoes, or just leave it off the pot to let the water evaporate while it’s cooking? 2. Do you add the bacon raw, and just before you start cooking the beans and potatoes? Thanks, Steve — love your recipes! Hi Kathie, Thank you for the great questions. I think whether you cover the pot or not is pretty much just personal choice. There is no right or wrong answer for the most part. 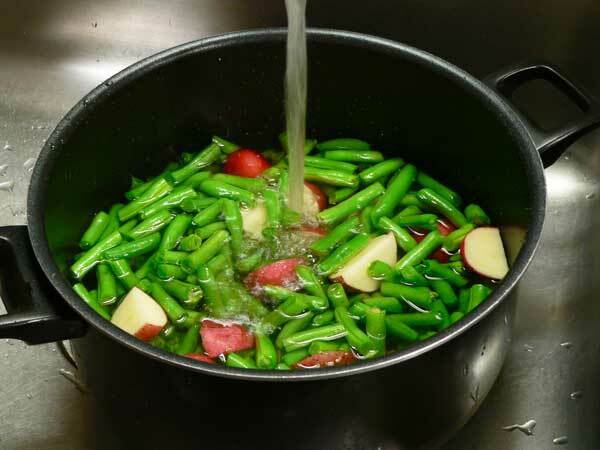 Most green type vegetables are cooked without a lid on the pot which is suppose to help them keep a bright green color when cooked. I’ve never tested that out personally, but it’s general consensus. And, as you mentioned, without a lid, the water will evaporate more quickly. The vegetables do lose some of their nutrients and perhaps some flavor as the water boils off, but I didn’t want a big pot of juice at the end. Most recipes would suggest bringing the water to a boil before adding the vegetables, but I get a bit lazy in that respect and will often just put the beans in water and start it boiling from cold. It’s just what I do, not saying it’s right or wrong. As long as you just don’t let the water boil completely away and run the risk of burning or scorching your vegetables, you’ll be good. Does that make any sense at all? Smile. As for the bacon. I had cooked bacon earlier and saved the bacon grease for seasoning the beans and potatoes. Since I had a couple of slices left, I just tossed them in the pot, but yes, it was cooked to begin with. I’d suggest you use bacon grease as the seasoning of course and should you just happen to have some leftover bacon, add it in. Otherwise, the bacon grease will give you a lot of flavor. 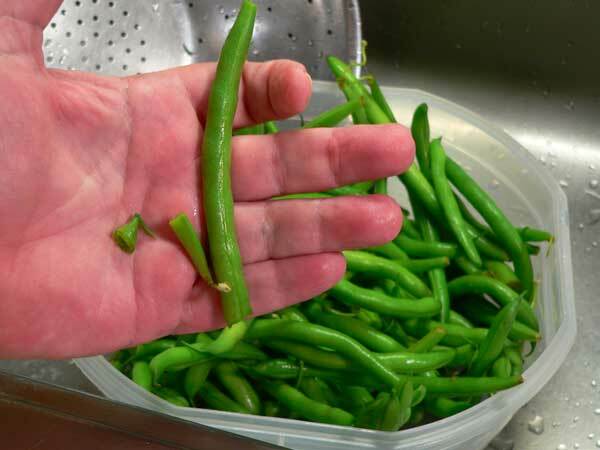 Back when I lived in the Piedmont, (late 70’s-’93) had a big garden and a passel of young kids I used sit under the water sprinkler while stringing and snapping my green beans, I stayed cool, the beans got clean and I could keep an eye on the kids. It was too hot to cook inside so I’d toss the beans and bacon fat in a cast iron pot that fit in my grill. Never heard of putting ‘taters’ into them until I moved to Alaska and met another ‘born Texan’ who proposed this exotic variation. 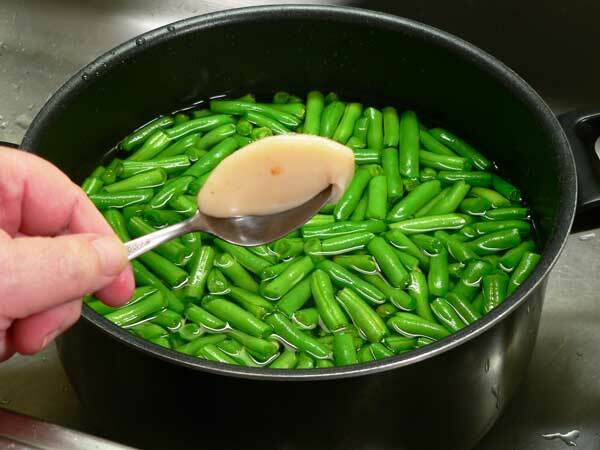 My Mama used the flat green beans. Can’t find them fresh in our town. I buy the Blue Lake canned (called Italian) variety. So, l follow your recipe except cut the cooking time. Love them. Thank you Steve. Hello everyone. 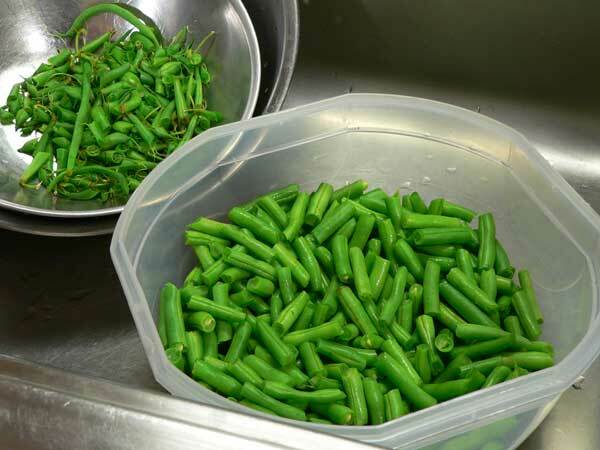 When I opened your email this morning, Steve, and I saw your photo of the green beans, I wanted a scoop!! I went to the store to pick up green beans and potatoes right after reading your newsletter. My beans are cooking right now. As the saying goes, “A picture is worth a thousand words.” Thank you so much for posting. Glad to hear you, Billy and Jan are all feeling better. You too, be blessed. Hi Joan, I’ll have to be careful about the pictures if they are going to have that kind of effect on you. Smile. But then, I’d love to have some more of these right now myself. I’ve got more in the fridge but have yet to snap them and cook them but it’s on the list for tomorrow. I hope you enjoy yours. Thank you for your concern of Jan and Billy, they both are recovering and doing well. Me too. Thank you for your visit and sharing your story. I do hope you’ll visit with us often. Be Blessed!!! -Steve PS-Thank you for being a subscriber to the Newsletter. Smile. That’s the way I cook my snap beans, just like my mamma, cooked to death. Mine still don’t taste like her’s did and I guess they never will but when I cook them I always think about her. I shopped with her one time and got my beans out of the same pile, cooked them up and carrried a sampling over to her house, nope not the same. I swore she must have spit in the pot cause I did everything just like she did. Mamma’s must have a special touch. Thanks for your news letters, I enjoy reading them. Hope you continue to feel better. 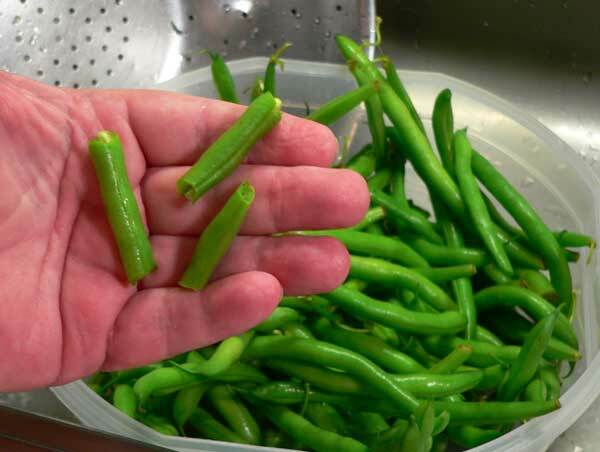 We had green beans or snap beans or pole beans (whatever you call them) in our garden when I was growing up in NC. I don’t remember Mama cooking potatoes with them but I’ve had them cooked together since then and even do it myself sometimes. I really like them. A couple of hints for first timers in the “city”: I think the fresh green beans we buy in the grocery store in a plastic zip-lock bag are a lot cleaner than those you buy at a farmers market or roadside stand. Therefore, I put a piece of newspaper on my kitchen table, put a bowl beside it, pour all the beans onto newspaper and sit down and start snipping away. I can go faster with a small paring knife than I can snapping them. Put in a colander to rinse. Also, I use a vegetable brush to scrub potatoes really good when I’m washing then. Scrub really hard. My goodness Steve, your posts Always take me back to my Grandma’s house! I AM going to cook this for sure! Thank you. I cooked beans and potatoes on Saturday, just like yours without the bacon added, or pepper. I have never added pepper, might add that the next time. My husbands favorite vegetable, still have some for leftovers. 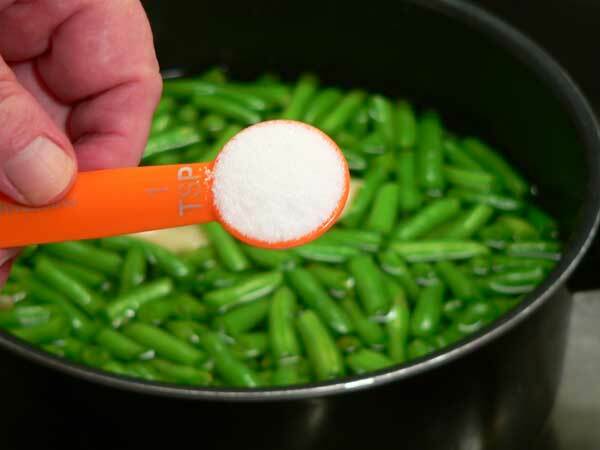 My mother always said that sugar brings out the flavor of vegetables and that is why I add it too. She must have been right, they are delicious! Still praying for your recovery and that of your friends too. You make yours exactly the way my Southern Grandma taught me. I am So Jealous–Would have Devoured that pot along with you! Alas, I No longer make these because my children just will not eat them–They seem to dislike everything I loved-food wise–and I miss it all. The green beans we grew in our garden were wonderful–they had purple seeds inside and cooked up a deep rich green. After all these years, I still don’t know the name of that particular variety of bean. My entire Family and hometown folk have long passed away–so I had no one I could ask. 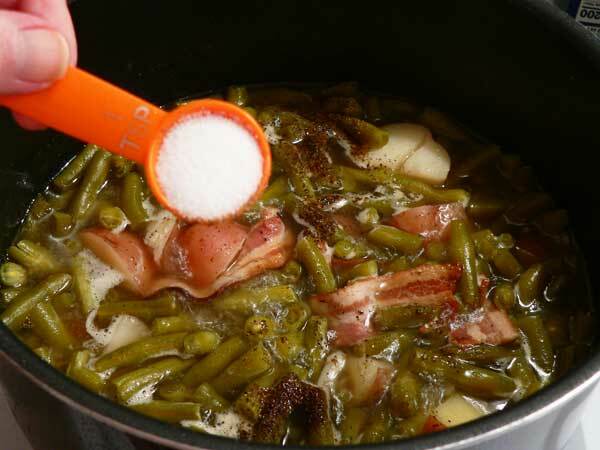 My favorite way to cook green beans. Beans and taters are a family favorite and when I make them for covered dish dinners at church, it’s one of the first empty dishes, along with my deviled eggs. My little great granddaughter calls them “doubled eggs”. Sir, thank you for your effort in preserving our Southern heritage. The “art” of made from scratch cooking is rapidly disappearing in today’s fast food, order out, box prepared culture. Grocery stores now pre-package meals that require nothing more than re-heating at home. Today’s kids-tomorrow’s families- will never appreciate the aroma of fresh veggies wafting out of the kitchen. Food re-heated in a microwave doesn’t waft! I was fortunate to be raised by a grandmother that put me on a kitchen stool in front of the stove and answered my constant “but why?”. Today I’m across the 70 yard line, but I still take the time to string pole beans, slice okra, tear collards or turnip greens, and serve ‘em with made from scratch corn bread cooked in a 100 year old iron skillet. My grand kids don’t appreciate the effort that produces these flavors. Meals brought home in a fast food sack, or zapped in a microwave and eaten in front of the tv don’t have the same satisfying effect. My Introduction To the “southern way” was breaking bushels of green beans on the porch with aunts and uncles. Have kept the tradition going for 50 + years. Canning quarts of them for the winter and enjoying them. Love the beans and the memories. Thanks, Steve.